The 2017 SCGA Championship season is officially underway and two familiar names find themselves atop the leaderboard at the 15th Annual Foursomes Championship at Rustic Canyon GC in Moorpark. 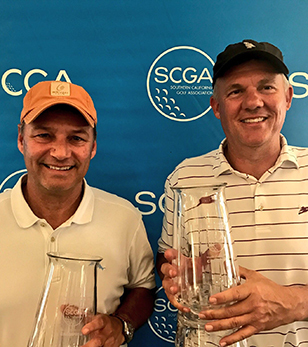 2015 SCGA Senior Player of the Year John Pate partnered with 2015 SCGA Mid-Amateur Champion Jeff Wilson to form a daunting duo, coming from behind on the second day to capture the title. The brotherly squad of Jerry and Jim Chang held a 2-stroke lead overnight after firing off an impressive 3-under round of 69 in the alternate shot format. The pair of brothers worked in cohesion around the links layout to the tune of seven birdies, including a stretch of three in a row on the back nine. After sleeping on the lead, the Chang team came out sluggish with a double-bogey on their first hole. They weren’t able to recover, and the Pate/Wilson team pounced. Following up a solid 1-under round of 71 on the first day, the veterans were able to come out hot with three birdies on the front nine. After making the turn, their wheels began to wobble. Following a double on No. 11, the duo carded three straight bogeys on No. 15, 16 and 17. After a par on No. 18, Pate/Wilson pulled into the clubhouse with a 3-over 76, holding onto the victory by only two strokes over last year’s defending champions Nathan Celusta and Jason Pridmore.